One of the items on my 101 list was to make my grandfather's/mom's homemade meatballs and sauce recipe. I am happy to say that over the weekend I achieved this feat! Now this isn't some easy open the jar of sauce and add a few extra dashes of spice, this is make it in the morning let it cook all day need to stir and let the flavors meld type stuff. I have assisted my parents in making it before but I've never done it all on my own in our kitchen. I must start off with disclaimer this is one of those type of recipes where things are simple but don't really follow the recipe and some things are added. So I apologize for the craziness of it. 2. Add cans of tomato paste to pot. Fill cans with water (getting off all the leftover paste!) and add that. Add the can of crushed tomatoes. My hint of the day ... open up all the cans before you start trust me it helps! 3. Add Italian Seasoning, Parsley, Oregano, Mint to taste and stir so ingredients start to combine. Let it start to heat at a low heat. 1. In mixing bowl combine beef, 1 clove pressed garlic, bread crumbs, egg, salt, pepper and cheese. 2. Mix together all of the ingredients with your hands! Form into about 1 inch balls. If you like bigger meatballs go ahead and make them bigger it's all up to you! 3. In a saute pan brown the meatballs on at least two sides (I prefer 3) then put them into the sauce. You will probably have to do it in batches. 4. Simmer or cook on low heat for 2-3 hours. Stir on a semi-frequent basis, stirring gently from the bottom to keep incorporating all the flavors. I was too slow to get a photo of the finished spaghetti dinner since we devoured it right away! This is a great recipe for a crowd, just double or triple the amounts of everything. My mom is a big fan of freezing some of the sauce and meatballs for later in the month. I hope you enjoy one of our family favorites! 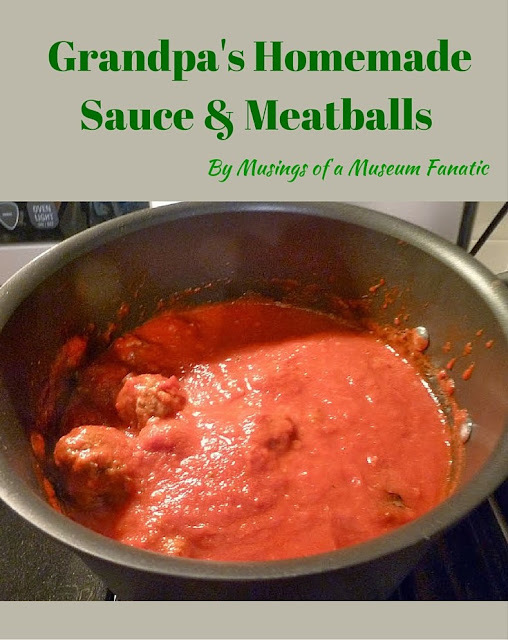 I love making homemade meatballs! I've never tried frying them in a pan before adding them to the sauce, I usually bake them in the oven for 30-45 minutes depending on size. Next time I make them I'll have to try the frying pan technique! That looks super tasty! YUM! It did turn out really well! I have always liked it since there is so much flavor not just in the sauce but the meatballs too.